– “U.S. Ambassador’s Visit to Ancestral Home Town,” East Anglia Daily Times, October 2, 1929. It’s no secret around 225 Greenwood that Charles Gates Dawes was the great-great-grandson of William Dawes of St. Ann Street in Boston, Massachusetts. William Dawes was a tanner who rose to fame in his midnight ride on the night of April 18-19, 1775, when he and Samuel Prescott rode from Boston to Concord to warn the militia of the advance of the British regulars. (1) However, Dawes’s lineage goes back to two other Williams, tying him, like all Americans, across the sea. In this brief episode in a life crowded with pageantry and honors, we see not only an interest in one’s origins, but a reverence for them. We should all be so lucky to trace back our family history, to discover and engage in a very personal past, whether or not we find a connection to an historical figure whose name has been enshrined in the Revolutionary narrative alongside fellow Bostonian Paul Revere. (1) “Midnight Ride of…William Dawes?” Chicago Tribune, April 13, 1975, 13. (2) “English are Now Interested in Dawes Family Tree,” Southeast Missourian, August 16, 1929, 10; “Dawes Finds His Coat of Arms in English Borough,” Chicago Daily Tribune, August 6, 1929, 15. (5) “Dawes Paid Honor in Home of Kin,” Washington Post, July 21, 1929, M2; “U.S. Ambassador’s Visit to Ancestral Home Town,” East Anglian Daily Times, October 2, 1929; Andrew Bradstock, Radical Religion in Cromwell’s England: A Concise History from the English Civil War to the End of the Commonwealth (London: I. B. Taurus & Co. Ltd., 2011), 4-6. (7) “Sudbury Honors Dawes,” New York Times, July 4, 1929, 5. 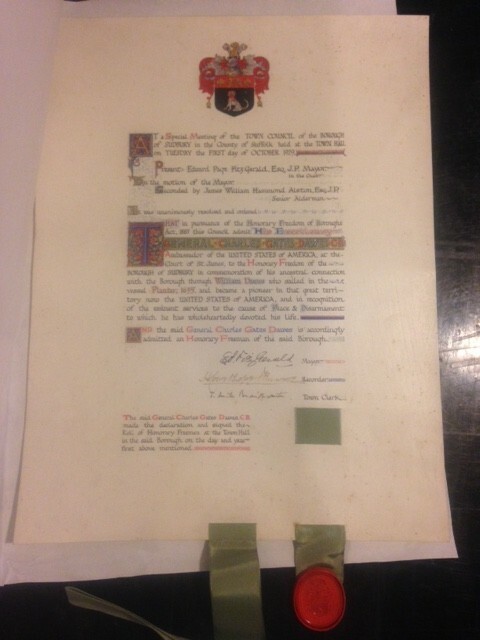 (8) “The Honorary Freedom of Boroughs Act, 1885,” in John F. P. Rawlinson and J. A. Johnston, eds, The Municipal Corporations Acts and Other Enactments Relating to the Powers and Duties of Municipal Corporations Thereunder, with Notes and References to the Cases Thereon (London:Sweet & Maxwell, Ltd., 1903), 397. (9) “Home of Dawes’ Forefathers to Honor U.S. Envoy,” Chicago Daily Tribune, July 21, 1929, 18. (14) “General Dawes Honored by Sudbury, Eng,” Daily Boston Globe, October 2, 1929, 12. (15) Ibid; also quoted in “Ancestral City Cheers Dawes,” Los Angeles Times, October 2, 1929, 11. (16) “Dawes is Honored in Ancestor’s Town,” New York Times, October 2, 1929, 1, 4. (17) “Cheer Dawes at Home of His Ancestors,” Chicago Daily Tribune, October 2, 1929, 1. See also the records of the Dawes Family Collection, Evanston History Center. (19) Mentioned in all articles published on October 2, 1929, cited above; also “All Sudbury Ceases Labor to Extend Dawes Welcome,” Washington Post, October 2, 1929, 3.